Hot video! Please pass this around to your friends, family, coworkers and neighbors now! This video would be a more difficult to slow it down a little (like I suggested about the other video). For me to really “get” this one, I do have to use “pause” in several places. I do know how to pause/replay things, but having things slow down a bit would be desirable (for me and any other slow readers). I do have “minor” aphasia brain damage, and there are a LOT of potential voters who have similar difficulties for varieties of reasons. I am voting Yes on 3. this video puts a finality to it. i need numbers and these numbers make sense. you cannot hide from the budget. next step. actually having the state stick to a budget. if i dont stick to a budget, my creditors will come after me… we are the creditors to the state, will they listen to us?? I put the state legislator on notice. You certainly do not need to apologize for having to push the pause button. You should be commended for being sufficiently concerned to the time to understand the problems that are confronting us all. I watched the video several times trying to figure out why the mainstream media doesn’t focus on this. I’ll bet that it’s because they’re too concerned with 30 second sound bites instead of hard facts that educated voters need to know. So just because Baker said so the numbers are real? I thought we as a country were trying to step away from assuming politicians are telling the truth all of the time. Also he may be lieing to get an edge at the polls by making the democratic party look worse. 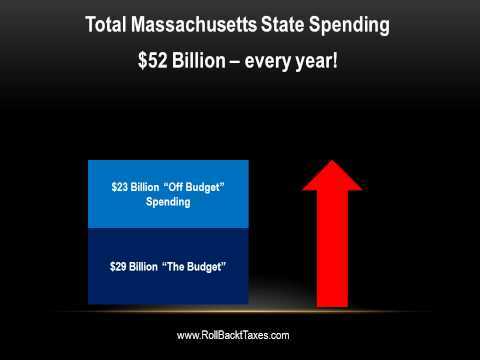 I have been pushing this point over and over: The state budget is $29 billion, but they spend $52 billion. Why in the world should we entrust them with OUR money????? Career politicians LOVE it when you stay at home, when you think your vote doesn’t count! They LOVE couch potatoes! Get out and do something! Talk to your neighbors. Call up the Alliance to Roll Back Taxes and/or candidates you BELIEVE in, and ask how you can help! You can pass out fliers, make phone calls, hold signs, deliver signs, stuff envelopes, whatever you want to do. Even if it’s just ONE DAY, or AN HOUR HERE AND THERE, whenever you can, you CAN help and you CAN make a difference! America is waking up, and you can see it in the many surprise upsets during the primary…and the upsets about to happen on November 2nd! We cut the sales tax on food here in Utah from 6.6% to 3% and our state is still living within its budget. Those of us who buy food are saving about a dollar on a typical visit to the grocery store. Some are saving more since this is Utah and there are more mouths to feed. It’s a good video ad. Well, It is our money isn’t it. The question is, is, Why? Why do we always land up paying for things that our congressman deems necessary. Because we vote for them that’s why. They are the one’s who speak for the people of this country but, not all the country. We put these people in office. There there for years before we vote them out. And by that time, it’s a little to late. And for us poor folks here in TN. Were out of luck. We still have a higher food tax. Seems, anyway you look at it: We the people are always gonna be taxed. There was a time when school teachers were underpaid, but no more. The per-pupil cost in this state is astronomical, but the kids come out of school dumber than ever. If this were a private industry they’d be out of business decades ago. You have collusion between politicians and vested interests at the expense of the public. That’s the only thing keeping this racket going. Term limits are never going to be voted into law, BUT we can limit them by our vote and we can start next Tuesday. FIRE them all! Elect new people, and don’t let the present ones do any more damage. Yes, YOUR one vote WILL count. Depend on it, because If you don’t vote, you give up the right to complain about who’s running the store… If one added up all those individual ‘Mine won’t count’ votes, they’d make a sizeable bloc, and could swing an election the other way. All of the above is why Over the past 30 years I have NEVER voted for the re-election of ANYONE. Because onse they get elected there is only one important THING….. RE-ELECTION!!! sO THEIR VOTES GO TO THE MONEY, CORPS, UNIONS, ETC, AT YOURS AND my EXPENSE. vOTE ‘EM ouT now!!! Carla Howell has been studying this states budget for about 14yrs. and KNOWS the truth and it is that the STATE budget can be cut, not local,state…dont be afraid to say no to people who spend and spend and get no bang for the buck…we’ll be fine..Just Do It!